More than 80 scientists and communication professionals from 11 countries converged on the Smithsonian Institution’s Ripley Center in Washington, DC, from 10 - 13 May, 2015, to participate in a visualization and modeling workshop. 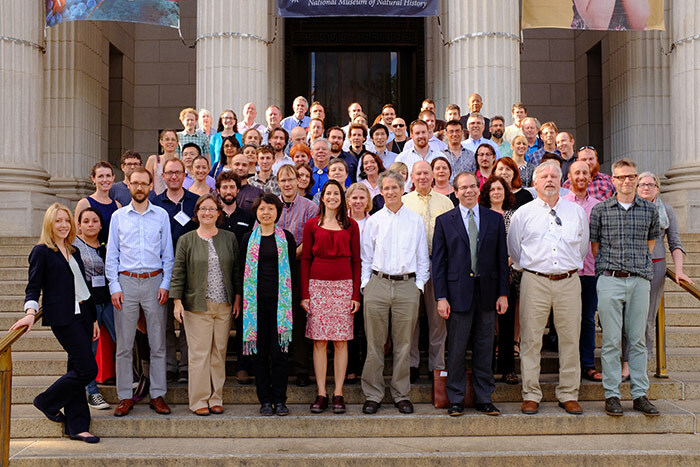 More than 80 scientists and communication professionals from 11 countries converged on the Smithsonian Institution’s Ripley Center in Washington, DC, from 10 - 13 May, 2015, to participate in a visualization and modeling workshop. The workshop took the first steps toward modeling, visualizing, and communicating deep carbon, and explored the many considerations, both creative and scientific, implicit in the project. On Monday, after a welcome message and preview from Workshop Chair Elizabeth Cottrell, Smithsonian Institution, Jesse Ausubel, Sloan Foundation, took the podium and challenged the community to think big when it comes to the legacy of the Deep Carbon Observatory. Robert Hazen, Carnegie Institution of Washington, relayed the importance of creating a carbon model greater than the sum of its parts. Mark Hirschmann, University of Minnesota, presented a grand tour of Earth’s deep carbon cycle, pointing out its immense scale and mysteries. Matt Schrenk, Michigan State University, followed with a presentation about the challenges of conveying the distribution, diversity, and system interaction of the deep biosphere in a planetary carbon model. Jie Li, University of Michigan, presented evidence indicating the potential of Earth’s inner core as a significant carbon reservoir. Louise Kellogg (left), University of California, Davis, showed examples of groundbreaking mediums for communicating the vast time and space scales of deep carbon science. Eric Jolly, Science Museum of Minnesota, discussed the urgency of cultivating and engaging the public about deep carbon science and science as a whole. David Rejeski, Woodrow Wilson International Center for Scholars, provided insight into challenges of science communication and the impact of games as communication tools. Richard Katz (right), University of Oxford, began the program on Tuesday by discussing the critical factors in melting and melt transport in the presence of water and carbon dioxide. Mark Behn, Woods Hole Oceanographic Institution, talked about the challenges of modeling carbon dioxide fluxes at mid-ocean ridges. Fabrice Gaillard, Institut des Sciences de la Terre d’Orleans, focused on the geodynamics of partial melting. Tom Lucas, Thomas Lucas Productions, showed examples of complex visualizations from his work, and Michael Starobin, NASA Goddard Space Flight Center, implored the audience to remember the importance of story. On Wednesday, Jennifer Macalady, Pennsylvania State University, showcased examples of filming in the field and asked the scientists not to underestimate the importance of sharing their work with broader audiences. Michael Walter, University of Bristol, suggested using the intrigue of diamonds to drive interest in deep carbon science because of their familiarity and place in popular culture. The talks were punctuated by three productive breakout sessions, in which participants were asked to address a range of issues related to communicating, modeling, and visualizing deep carbon science. Participants also experienced live demos of five modeling and visualization products at the workshop’s Visualization Expo. Representatives from NASA World Wind, NOAA Terra Viz, ESRI (Environmental Systems Research Institute), GPlates, and MATLAB© (Matrix Laboratory), demonstrated their products and answered questions about how their platforms might feature subsurface carbon-related data. Evening events included an icebreaker, a reception, and a trip to Q?rius. At the icebreaker on Sunday, Cottrell distributed playing cards from a specially crafted deck that had a different image from DCO on each card. She challenged attendees to seek out an expert at the icebreaker who might be able to explain the origin of the enigmatic carbon-related image printed on the card. On Monday, the Smithsonian’s Global Volcanism Program hosted a reception at the National Museum of Natural History’s Geology, Gems, and Minerals Hall. The reception took place after hours, giving workshop attendees a chance for a private look at the spectacular collection of gems and minerals, including carbon-rich specimens such as the Hope Diamond and the Allende Meteorite. On Tuesday, a small group was given a private tour of Smithsonian’s state-of-the-art learning center Q?rius. The professional backgrounds and skillsets of the workshop participants were as diverse as the minerals in the National Collections. Attendees included geodynamicists, deep carbon and Earth scientists, and leaders in modeling, visualization, and science communication and education drawn from companies, academia, and informal learning institutions around the world. That variety helped spark frank, cross-disciplinary dialogue, and was clearly a catalyst for new ideas and future collaboration. The workshop itself is only a kick-off meeting to ignite a 5-year effort to model, visualize, and communicate about deep carbon. The workshop organizing committee will create a road map from the breakout summaries, personal participant essays, detailed post-workshop survey results, and their own impressions. They will present the roadmap to the DCO community along with a call for proposals to seed and jump-start modeling, visualization, and communication efforts. Group photo taken on the steps of the Smithsonian Institution National Museum of Natural History by Katie Pratt.